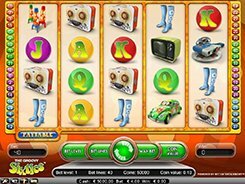 Groovy Sixties is a video slot from Net Entertainment with 5 reels, 4 rows and 40 paylines. The theme of the slot revolves around things that were invented or made their first public appearance in the 1960s, so on the reels you will see a lava lamp, gumboots, a Volkswagen Beetle, a television set, etc. There are also standard playing card icons from J to A. Before any spin you can change a coin value ($0.01 to $0.5), the number of coins per line (1 to 5) and the number of active lines, thus the top bet in the game reaches $100 per spin. Groovy Sixties has a wild symbol which is the slot’s logo. Like in other video slots, the wild helps create winning combinations by substituting regular icons. 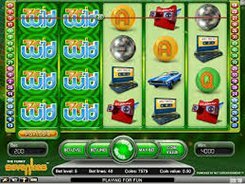 Besides, the wild awards the largest jackpot of $2500 if five of them land on an active payline. A scatter symbol represented by a woman triggers 5 free spins if these three appear in any position on the reels. The free spins can be retriggered from within the feature. Other decent awards you can win in the slot are $1000 (five VW Beetles), $625 (five reel-to-reel tape recorders) and $500 (four wild symbols).